Beef Dumplings is a Mongolian food recipe called buuz that can be steamed or fried. Mix the flour, water and salt into a smooth ball of dough. Set aside to rest for 20 minutes. In a lightly floured surface, shape the dough into a long cylinder. Slice the dough into 24 equal pieces. Roll each piece into individual disks about ⅛" thick. Mix beef, onion, garlic and salt. 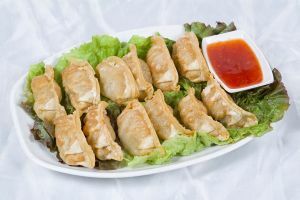 For fried dumplings, place about 1 tablespoon of meat in the center of the disk of dough. Fold in half and pinch the edges to seal. Deep fry in hot oil until golden brown on both sides, turning once. Drain on paper towels. For steamed dumplings, place about 1 tablespoon of meat in the center of each disk of dough. Pinch the edges of the dough together to form tiny pleats, shaping the dumpling into a small purse that resembles a bulb of garlic. Place on a steamer rack in a large kettle filled with 1" of water. Cover and steam for about 20 minutes, until tender. Serve hot with soy sauce for dipping. Makes 24 dumplings.